Continuing the hit line of Stargate SG-1 action figures is this two-pack depicting two epic moments from the hit series’ final season! 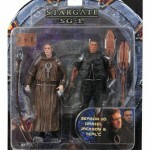 Featuring Daniel Jackson as an Ori Prior and an aged Teal’c from the series-closing Unending. Also included are two figure-sized Transport Rings compatible with the Stargate SG-1 Series 4 set!